Whether it’s a wedding ceremony in your backyard, a Christmas party – or some other special occasion – having the right type of lighting present makes all the difference in the world between a romantic, ambient atmosphere – and one that is alien and unwelcoming. Want some unique, decorative lighting for your backyard that meets these standards, and is also flexible AND cost-effective? Then you have arrived at the right place. LED outdoor string lights to enable you to create loads of unique and enticing lighting patterns and effects in your backyard, and they do so by making use of LED lighting technology that is energy efficient, long lasting, and good for the environment. In this article, we give you all the information you need to know about these unique outdoor decorative lights, and then we go on to review what in your view are the best bulbs of this sort currently on the market today. Read on to find out more. First off, though, a word on light emitting diodes – or LED lighting – and its manifold benefits. This lighting technology makes use of a semiconductor material, through which an electric current is passed in order to generate light within the visible part of the electromagnetic spectrum. It does this because the electric current knocks loose electrons from the surface of the semiconductor material, and in the process, the electrons emit small particles of light known as ‘photons’. LED lights are essentially just a means of converting electrical energy into the light! And they do this exceptionally well. Compared to older forms of lighting technology – like incandescent lights and fluorescents – LEDs are far more energy efficient and long lasting – up to 80 percent more by some estimates. This makes them far better for the environment, insofar as they generate a lot fewer carbon dioxide emissions and thus don’t contribute nearly as much to global warming and other forms of environmental destruction. Indeed, LEDs have been touted as one of the major solutions to our current eco-crisis. In fact, you will now find LED lighting being used in all sorts of applications – domestic and commercial – and for all sorts of purposes – decorative lighting, novelty lighting etc – from which it was previously absent. One area where LED lighting is really starting to take off is the field of outdoor domestic decorative lighting. There are now all sorts of LED lighting products available on the market when it comes to decorating your yard for the purpose of special occasions – like backyard weddings, family reunions, Christmas parties, and the like – as well as for accenting your garden and home’s best features during the rest of the year. 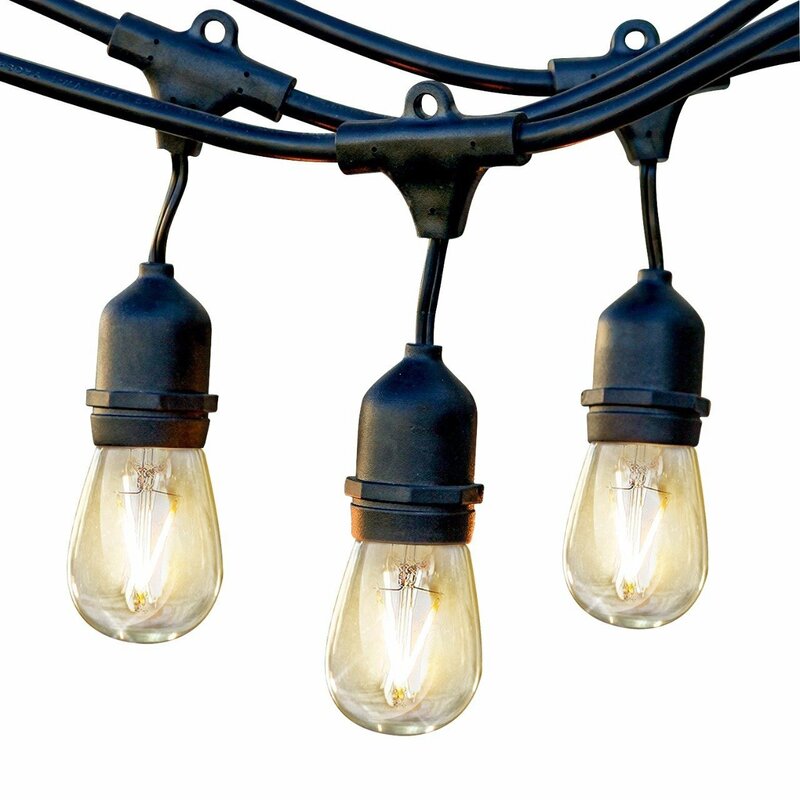 One of the more unique products in this line is that known as outdoor LED globe string lights. These devices consist of a string of wire – usually made from copper or some other sturdy material – along which tiny little light bulbs are embedded – or alternatively hang from sockets attached to the material. The string material is so designed as to be tough and durable, but also flexible enough that you can coil it, drape it, wrap it and hang it from whatever structures exist in your yard – patios, balconies, decks, fences, walls, trees and shrubs, and a whole lot more – thus enabling you to create any number of unique lighting patterns and effects in your yard – and to tailor your decorative lighting to your specific circumstances. These lights can be either battery powered, or reliant on access to mains electricity – in the latter case, they will come with a power lead attached to the lighting string. When considering which set of LED globe string lights is right for you, there are a number of things you need to take into consideration. First is the size and lighting needs of your yard, which will determine how much string – and how many light bulbs – you will require. The amount of string you get with your lights differs from product to product – some offer much more string than others; alternatively if a certain product doesn’t come with much lighting string – but meets all the other criteria you are looking for in a set of lights of this sort – you can buy multiple strands – in many cases they are designed so that you can connect them together. The brightness of the lights is another factor you have to consider; rated in lumens, you will probably find this figure listed on the packaging of your product. Determine also, whether your lights come with a dimming option, or with alternative working modes – like flash, pulse, strobe, fade, etc – which may be required for your lighting purpose. Next, you have to determine whether your outdoor lighting will be able to access to an external power source (ie. mains electricity) – if that is not the case, then you will need to buy a set of LED globe string lights that are battery powered. Whilst battery powered lights can be placed in whatever position you like, the batteries will also have to be replaced much more frequently – creating much more hassle for you. The exception is if your battery powered lights are solar powered; then they will automatically re-charge themselves – all they require are access to direct sunlight (admittedly, not a given in all climates and at all times of the year). As your lights will be used outdoors, they also need to handle whatever the elements throw at them – from scorching sun to pelting rains and winds. Before purchasing a set of LED outdoor globe string lights, first check that they are UL certified – which means they are basically weatherproof, and able to stand up under all climatic conditions. You don’t want a set of outdoor lights that crumbles at the first sign of inclement weather! Most of these lights are really stylish – they are some of the most attractive decorative lights out there and will give your yard a really enchanted, fairy-land atmosphere. And because the lights are embedded within flexible strands of wire – they enable you to create all manner of unique lighting patterns and fit your outdoor lighting to the specifics of your situation. As we have seen, these lights also make use of LED lighting technology – which means they are far more efficient, long-lasting, and environmentally friendly than other outdoor lighting options out there on the market. They also generate next to no heat and are free of other annoyances like flickering and humming. Say goodbye to burnt out bulbs that constantly have to be replaced – and too expensive lighting that multiplies your power bills- these lights are efficient and economical enough that you can keep them running all night long without seeing any noticeable effect on your energy bills. Now that we have explored what these lights are all about – and their many benefits- it is time to look at some of the devices of this sort actually out there. 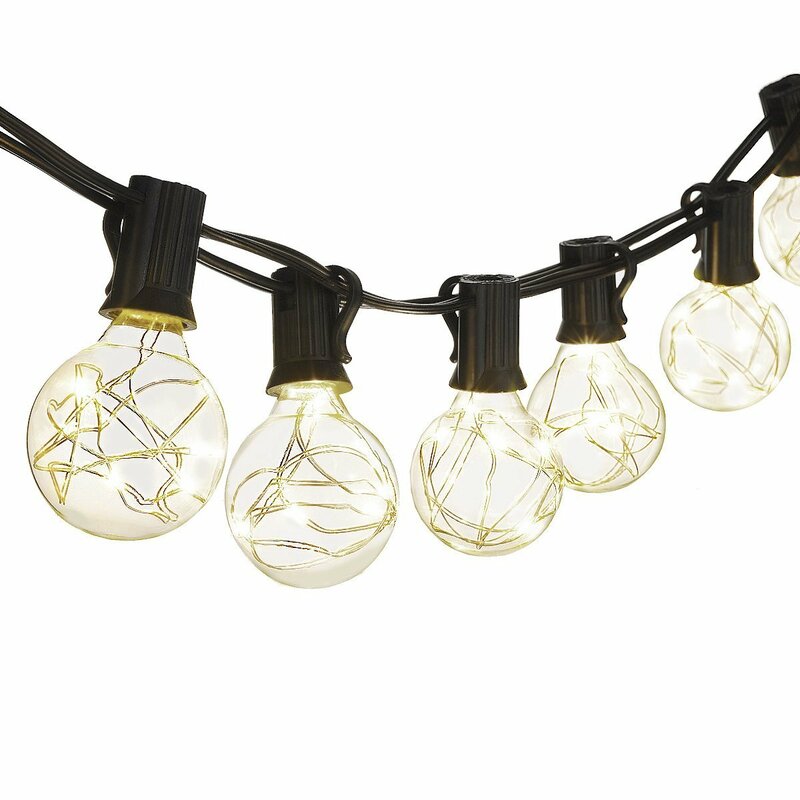 Here is our selection of the best LED outdoor globe string lights currently available on the market – without further ado, let’s look at some lights! Versatile outdoor decorative string lights, perfect for weddings, romantic dinners and other occasions. Fully dimmable, and makes use of cutting edge LED lighting technology. These outdoor string lights from Brightech will enable you to create an enchanting backyard atmosphere, just perfect for weddings, romantic dinners, or just relaxing in your own private retreat with friends of an evening. 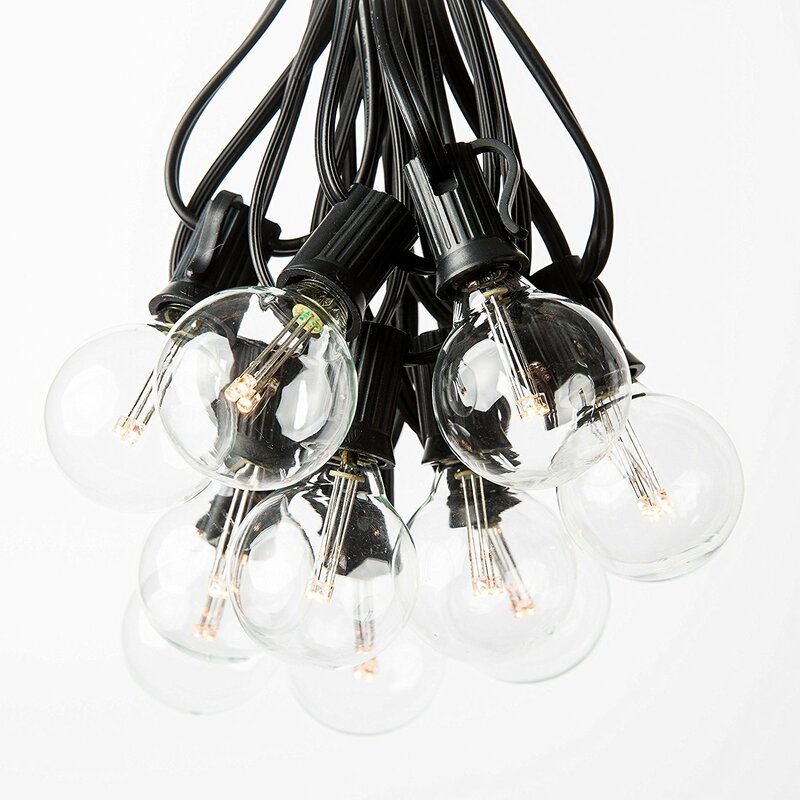 The vintage Edison bulbs with exposed filaments give off a soft, warm glow, and the outdoor globe string lights are fully dimmable as well, giving you exceptional lighting flexibility with this product. 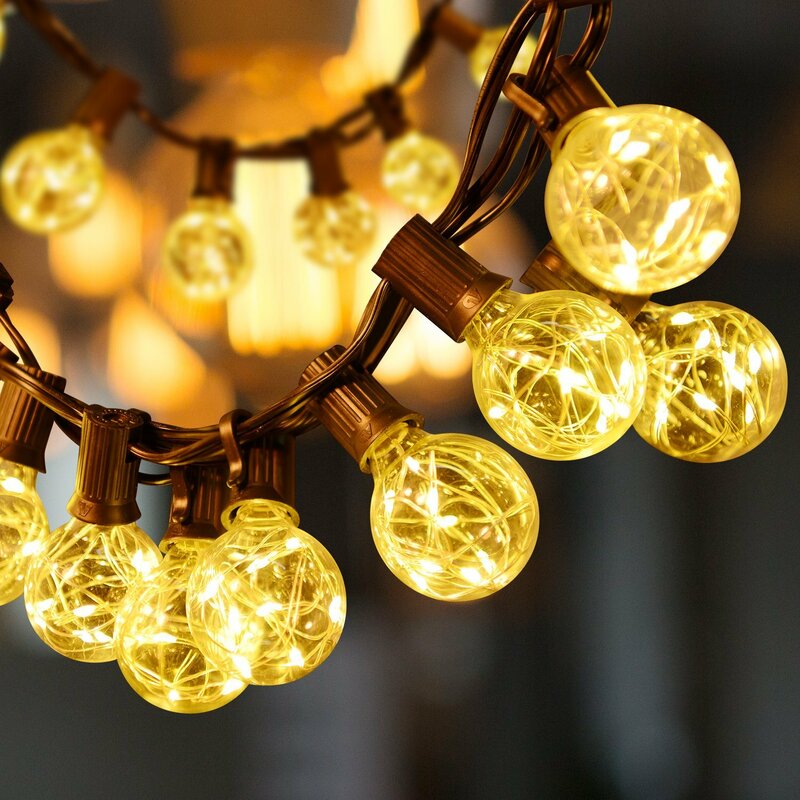 There are 45 feet of wire strand and 15 bulbs included with this purchase, the strands can be hung, draped, wrapped around your gazebo, balcony, trees and shrubs – and any other structures in your yard- there are so many possibilities here! They are also fully weatherproof (UL listed), such that these globe lamp bulbs will hold up under all conditions, from scorching sun to stormy winter evenings. The light cord is heavy duty and specially designed so that it can be left outside the entire year around. Perhaps best of all, this light makes use of the very best, most cutting edge LED lighting technology, that is energy efficient, long lasting and eco-friendly – these lights also have extremely low heat output, making them safe to handle despite hours of usage. And it’s all backed by a full three year manufacturer’s warranty, protecting you against any defects in design and workmanship. These truly are some fantastic little decorative outdoor lights from Brightech, one of the best products of this kind out there – and well worth the investment of your time and money. Beautiful outdoor ambient lighting, you get 17 feet of lighting string and 25 LED bulbs that are bright, long lasting and energy efficient. Sunnest’s LED string lights can be used to create any number of unique lighting patterns; they will serve as excellent decorative lighting at backyard weddings, parties and any number of other outdoor occasions. Even if you just want to enjoy a relaxing evening in your backyards, these lights will do the job. There are 17 feet of string included with this product, embedded with 25 G40 bulbs – there is also a four feet long length of lead wire and DC adaptor so you can connect the lights to an external source. Super bright, these are LED bulbs, so you can be sure that compared to older forms of lighting technology, they are loads more energy efficient, longer lasting AND environmentally friendly outdoor lights – they also generate far less heat, remaining cool to the touch despite hours of usage. Indeed, you will marvel at the energy savings to be had with these bulbs. They are also certified as IP44 weatherproof, so you can use them in all weather conditions and they will stand up – you will be enjoying these lights for many a night to come. Finally, it’s all backed by a 12 months’ manufacturer’s warranty – and if you encounter any other problems with your purchase, you can be sure the team at Sunnest will provide exceptional customer service throughout. For versatile, stylish and energy efficient outdoor decorative lighting, you can’t go past this offering from Sunnest, it’s highly recommended. Solar powered, outdoor string lights, perfect decorative lighting for your yard. 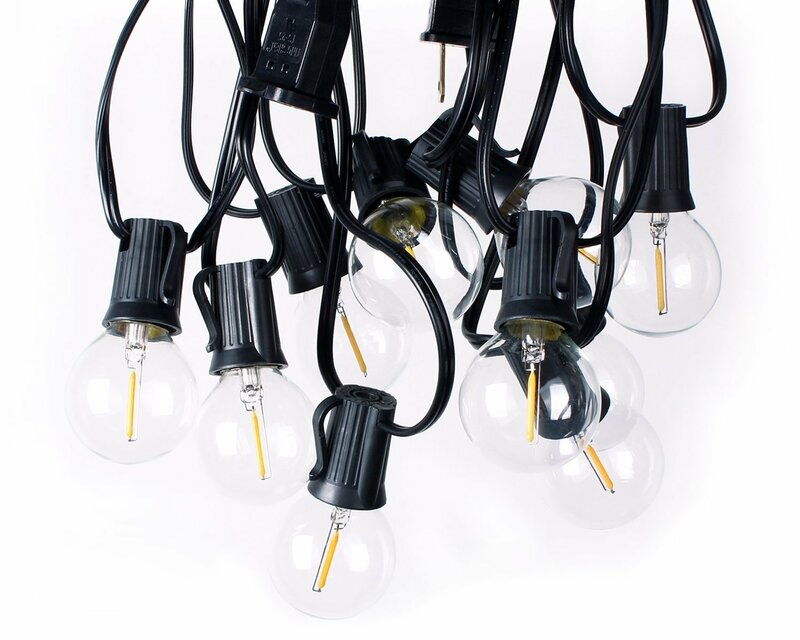 Includes LED bulbs- say goodbye to burnt-out filaments and overheated wires. This impressive set of outdoor LED string lights from Vivii makes some perfect decorative lighting for outdoor weddings, parties and other events – it’s also great if you want to accent your garden and outdoor décor, or create a relaxing sanctuary from the outside world in your own backyard. Indeed these are some lights that will do it all. With this product, you get 20 feet of string lighting embedded with 30 bulbs – there is in addition a 5 foot long power lead. Another fantastic feature of these lights is the inclusion of 8 different working modes; in combination with the fact that your string lights can be wrapped, draped, coiled etc to create any shape and lighting pattern you want – these are some of the most versatile outdoor lights out there. 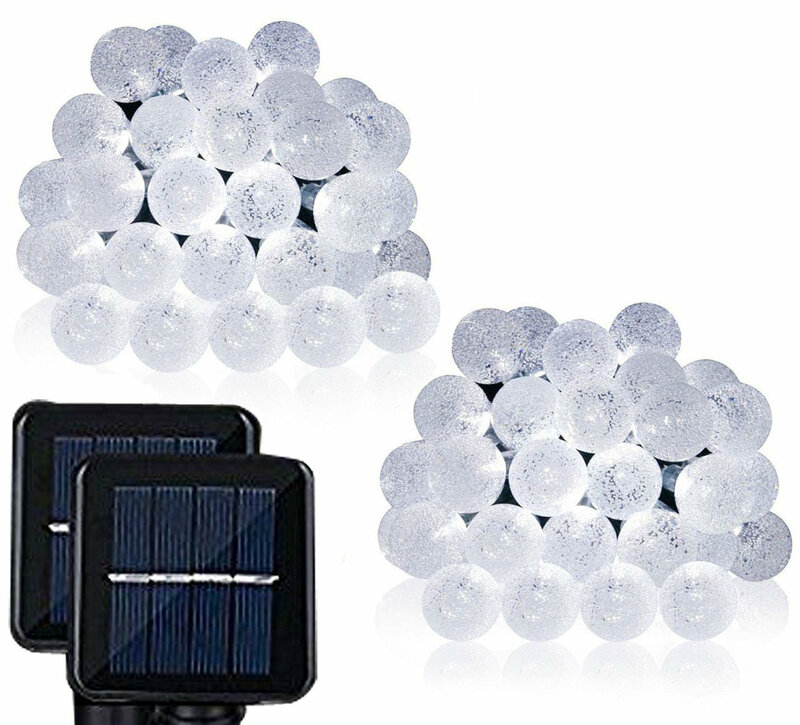 And as well as the power cord, these outdoor globe string lights are also solar powered, coming with their own panel and battery, that delivers up to 10 hours continuous power when fully charged. Just place in the sun during the day, and by night they will be ready to deliver a full night’s illumination to your yard. It’s all super easy to set up – full instructions are provided. Vivii have really hit a home run with their decorative outdoor string lights, you will marvel at the lighting effects you can create with these bulbs, and they do it all by utilizing cutting edge LED lighting technology. These are some lights that tick all the right boxes. LED lighting technology combined with innovative lighting strings – decorate your back yard and save money on power bills at the same time with these bulbs. Choose MPOW’s outdoor string lights if you want some outdoor decorative lighting that is attractive, versatile and economical – AND eco-friendly to boot. With 15 LED bulbs embedded along 49 feet of string lights, that can be draped, coiled, wrapped and hung from any structures in your yard, these are some really versatile lights – you will be able to create all sorts of unique lighting patterns and effects; and the soft, nostalgic glow emitted by the bulbs is ideal for outdoor weddings, parties, romantic dinners and other events in your yard or on the patio or deck. Certified as IP65 waterproof, these are some of the most rugged, robust outdoor lights around – you can be sure they will be able to endure all climactic conditions, and will serve you for many a night to come. They’re really easy to install, and because this is LED lighting technology, there are vast energy bill savings to be had with these super efficient and long lasting outdoor globe string lights. Finally, you get a full 18 months’ warranty and 45 days money back guarantee with these lights, which is really a testament to the quality of this product and the confidence the manufacturers have in it. There are so many possibilities with these lights, you will really enjoy playing around with them. Give the LED outdoor string lights from MPOW a try today. Create unique lighting patterns and effects in your own yard using these nifty LED lighting strings. Stylish and energy efficient outdoor decorative lighting. Long lasting, super bright, and stylish – those are just some of the qualities of these outstanding outdoor LED string lights from NEWPOW. If you want some soft, ambient lighting for your backyard wedding, birthday party, barbeque – or if you just want to accent your garden and outdoor décor of an evening – then these are the lights for you. 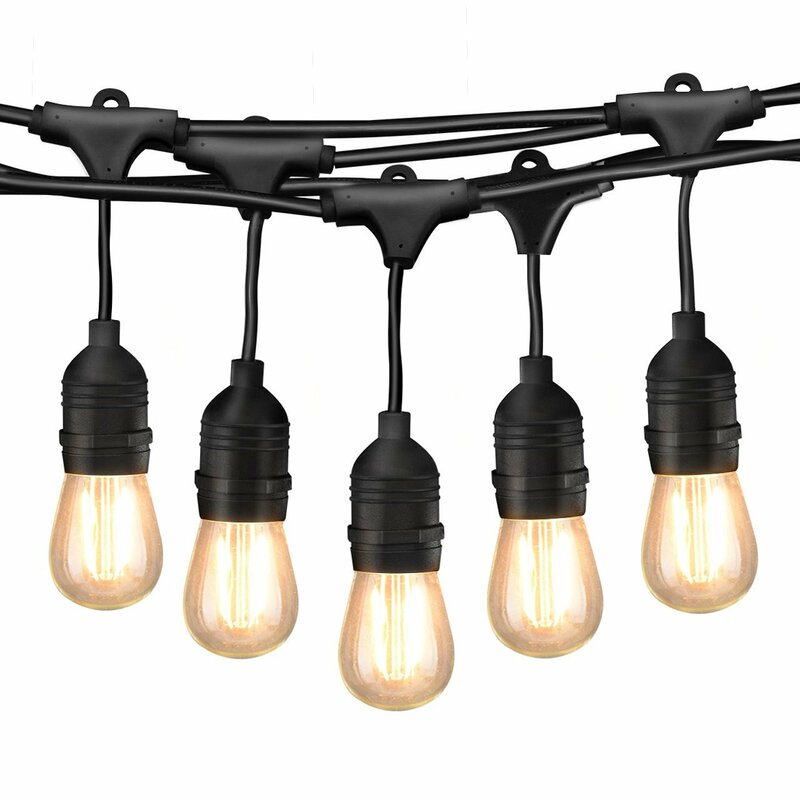 You get 18 feet of string lighting with this product, that is flexible enough to coil, drape, wrap around any structures in your backyard, enabling you to create any number of unique lighting patterns and effects. With a light output of 150 lumens, the lights are bright enough to illuminate any occasion, regardless of the external lighting conditions. 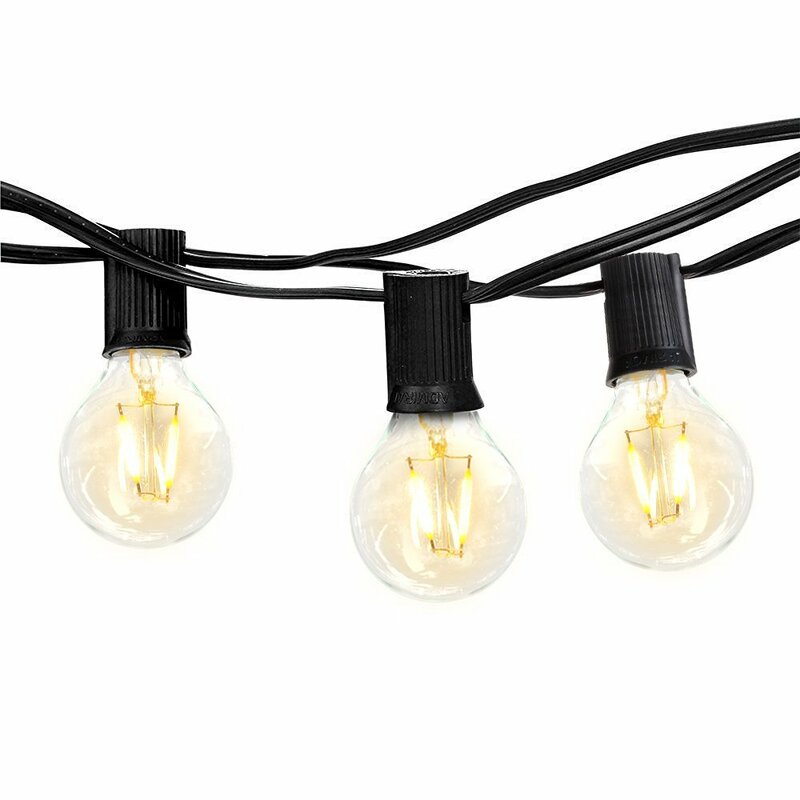 And because these led globe string lights are fully weatherproof, you can use them in scorching sun, wind, rain, snow, sleet – you name it – and they will get the job done every time. These are some outdoor lights you will be enjoying for a long time to come. In addition, all the lights contained here are LED bulbs, which are up to 80 per cent more energy efficient and long lasting than incandescent and fluorescent lights – they also emit far less heat, remaining cool to the touch despite hours of continuous usage. You can keep these cheap globe lights on all night without fear of fires! Finally, it’s all backed by a one year manufacturer’s warranty protecting you against defects in design and workmanship – if that isn’t a statement of confidence in this product, then we don’t know what is! Say goodbye to burnt out filaments, super-hot bulbs, and high power usage with the NEWPOW LED string lights. These are some of the best lights of this sort you will encounter, well and truly recommended. Decorate your yard using these innovative LED string lights. Flexible, energy efficient and long lasting bulbs- they tick all the right boxes.. Hometown Evolution’s LED outdoor string lights are suitable for weddings, backyard birthday parties, barbeques, family reunions, romantic dinners – and any number of other occasions. Even if you just want some soft, ambient lighting to accent your garden of a night-time, then these led globe lights will get the job done. You get a super-generous 100 feet of string lighting with this product, and 100 G40 light bulbs. 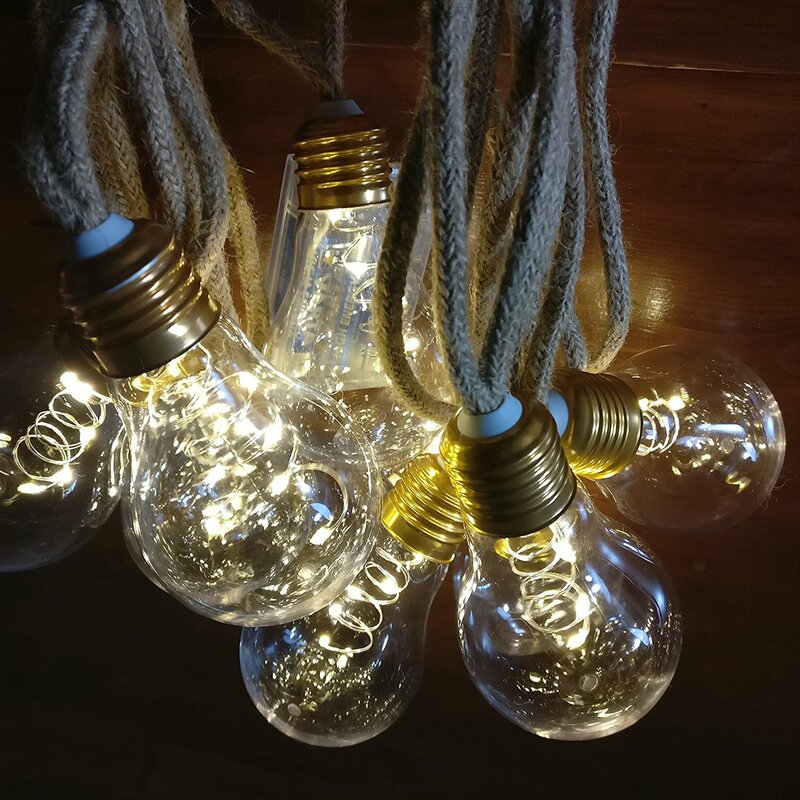 The string can be draped, hung, coiled or wrapped around any structures in your yard, enabling you to create any number of unique lighting patterns and effects with these led globe string lights. Fully weatherproof, there is no need to worry about them being damaged by wind, rain, snow etc, and because this is LED lighting, you can be sure that the power demands of these led globe light bulbs will be extremely low. You also won’t have to deal with the inconvenience of replacing prematurely burnt-out bulbs – these bulbs have a lifespan of up to 45,000 hours – and because they generate so little heat, these lights can be left on for hours at a time without risk of fires starting. For some attractive, affordable and SAFE decorative outdoor lighting, this offering from Hometown Evolution can’t be beat. Go out and grab a pack for yourself today. LED outdoor decorative string lighting, perfect for weddings, Christmas and other special occasions. Easy-to-replace bulbs that have low power usage and low heat output. Brightech are back with another innovative and stylish set of outdoor LED lights, these bulbs with transform your outdoor spaces into something beautiful and welcoming – just perfect for weddings, parties and other events. Even if you just want to relax out in your backyard on summer evenings, these led globe string lights are ideal for that purpose. Included with this product is 26 feet of lighting string that is tough and durable, yet at the same time flexible enough that you can create all sorts of unique lighting effects with it. The bulbs are all LEDs – that are energy efficient, long lasting (they have a lifespan of more than 20 years! ), and far more environmentally friendly than other lights out there. They also generate next to no heat, despite hours of continuous usage – you can keep these cafe string lights on all night long, and rest easy. Fully weatherproof, these led globe lights are suitable for use in all weather conditions including sun, snow, rain, wind and more. And for good measure, it’s all backed by a three year manufacturer’s warranty protecting you against defects in workmanship and design. Few outdoor decorative globe light bulbs compare with this offering Brightech, you will really appreciate the unique lighting effects you can create with these lights. Decorate your yard for special occasions using these energy efficient LED string lights – loads of lighting possibilities with the flexible strands. There are a lot of really bad outdoor decorative lighting options out there – this offering from Brightown is fortunately not one of them. Perfect for patios, decks, gazebos, balconies – or for placing in any other area of your backyard – you can use these cafe string lights to decorate your outdoor wedding receptions, parties, family reunions – or even just accent your plants and garden during the night-time. An impressive 25 feet of lighting string are included with this product – more than enough to deliver coverage to your entire yard. The strands are designed so that you can connect multiple lengths of lighting string together to create an even longer strand of lighting. Furthermore, the led globe bulbs are all LED bulbs – which are known to be super-bright, energy efficient, long lasting and far more eco-friendly than the older incandescent and fluorescent lights that have long dominated this market. They also generate very little heat output, and are free of other issues as well, like humming, flickering and the like. Suitable for all climates and seasons, these cheap globe lights are UL certified, meaning they are fully weatherproof. And they are backed by a one year manufacturer’s warranty, providing you with even greater peace of mind. 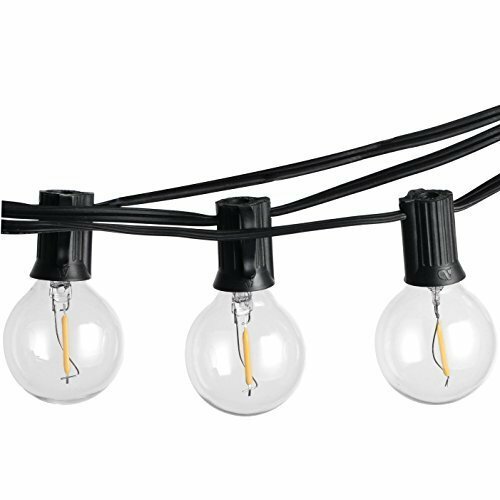 For some really attractive, flexible and energy-saving outdoor lights, choose these bulbs from Brightown, they are some of the best outdoor string lights going around at the moment. The folks at Finelady are to be congratulated on creating a really high quality set of LED outdoor string lights. These bulbs are suitable for backyard weddings, parties, and other events – for decorating your garden and home décor of an evening – and even for just relaxing out on the deck or patio with friends during the warmer months. You get 13 feet of wire with these lights, that can be coiled and hung around your patio, deck, gazebo, balcony, trees and shrubs, and any other structure in your yard – so you can place these lights pretty much wherever you want. As these lights are battery powered, no access to an external power source is required either, providing you with even more options as to where you place them. The bulbs are 100 per cent weatherproof, such that they will hold up under all conditions, and utilize cutting edge LED technology, that requires very low power consumption, and is very long lasting. These are some led globe lights where you won’t have to worry about replacing faulty bulbs at the most inopportune times! They also generate next to no heat, remaining cool to the touch despite hours of continuous usage. Finally, these lights are backed by a full two years’ manufacturer’s warranty, which provides you with even greater security and peace of mind – as if any were required! Versatile, stylish and eco-friendly – these lights from Finelady have everything you could ask for in a set of outdoor decorative lights. Go out and grab YOUR set, today. Energy efficient and long lasting outdoor decorative LED lights. Create your own unique lighting patterns and effect in your yard with these light strings. Last but not least in this review article, we have this offering from MPOW. Their LED outdoor string lights deliver some exceptionally attractive decorative outdoor lighting, that is suitable for all events held in your backyard, and for accenting your garden, patio and balcony of a night-time throughout the rest of the year. With 18 feet of lighting string included, you get lots of lighting coverage, and the LED bulbs are super-bright for good measure – some of the best out there so far as brightness goes. They also are extremely energy efficient, long lasting, and generate very little heat as a byproduct of their operation – which makes these some of the safest outdoor led globe light bulbs out there. They are also some of the most eco-friendly! Fully weatherproof, these lights are extremely robust and rugged also – whether it’s pouring with rain, howling with wind, or snowing a blizzard- these lights will withstand what nature throws at them. Easy to install and replace the bulbs in the sockets hanging from the string (full instructions are provided), these lights are also backed by an 18 months’ warranty, and a 45 days money back guarantee, so that if you are in any way dissatisfied with your purchase you can return it to the manufacturer and get a full refund, ‘no questions asked’. We’ve reviewed some very fine lights in this review article, and this offering from MPOW is no exception. They’ve brought out some really great little bulbs here, and it’s a great note on which to round out this list of reviews. Well and truly recommended. Want some decorative lighting for your yard that is flexible, energy efficient and long lasting? Then these LED outdoor globe string lights may be the product for you. They enable you to create any number of unique decorative lighting patterns in your yard, and they make use of LED lighting technology that is energy efficient, long lasting and environmentally friendly. These are some lights that tick all the boxes. Did you enjoy the content? Blogger, editor, developer who loves green living. Interested in photovoltaics and solar lighting. Reviewing solar products since 2013. Previous story What is LED Art? LEDwatcher © 2015 - 2019. All Rights Reserved.